Interweaving UC and mobility into a desirable user experience has long been an insurmountable challenge, as our go-to expert on this topic, Michael Finneran, of dBrn Wireless, has often shared with us here on No Jitter. But new approaches keep popping up, as we saw last week at Enterprise Connect 2019. I heard about a couple of these strategies while visiting with cloud communications providers Fuze and Metaswitch on the Expo floor. And I read about another, from Verizon, as I scoured the announcements planned for the event week. 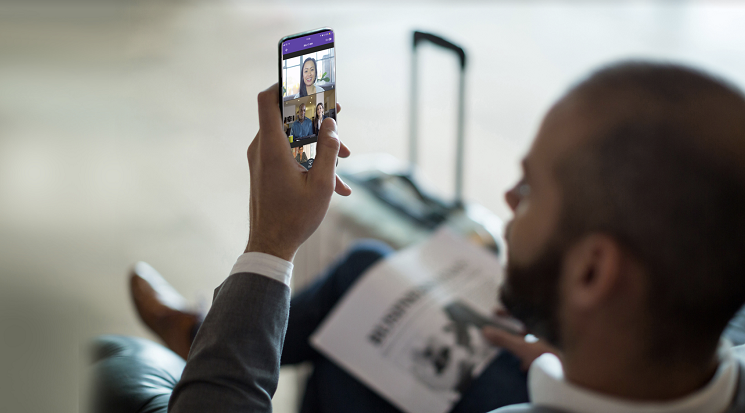 At Enterprise Connect, Fuze and Samsung Electronics America revealed that they’ve teamed up on a software-hardware solution aimed at meeting the needs of an increasing mobile and remote workforce. “The workplace is changing, and the way we think about talent for the workforce is also changing -- it’s less about nine to five and the place, and more about the responsibilities,” Eric Hanson, Fuze VP of product marketing, shared during my EC briefing. Frontline workers need to be part of the equation, Hanson added. Not only should companies be bringing frontline workers into the collaboration fold, they should be doing so in a way that’s consistent with the experience of knowledge workers sitting in the home office and other participants in cross-functional teams, he said. But being able to provide the complete audio, chat, and video experience to workers who only encounter Fuze on their mobile devices turned out to be limited based on the device hardware, added Michael Affronti, SVP of product and design at Fuze. That’s where Samsung fits in. “For us, this partnership is all about enabling digital transformation to the mobile enterprise,” said Pierre Couteau, senior director of strategic alliances at Samsung Electronics America. It’s not just about jumping on the mobility train, but about making sure that workers can use their smartphones and tablets for UC “very easily and very securely,” he added. Of course, given Samsung’s recent “Unpacked” announcements, including the Galaxy S10 and Fold models plus 5G and Wi-Fi 6 support, state-of-the-art device technology and high-density, high-speed networks will come into play in optimizing the Fuze experience, Couteau said. Specifics on product plans were limited, but the idea is that Fuze would be able to leverage Samsung device APIs to elevate the user experience. For example, with its software for the Fold, it might enable a user to use video conferencing on the full or folded screen, and when the device is opened flat, to run various tasks in parallel on different segments of the screen. Through the partnership, Fuze will be able to expose unique capabilities of its audio, chat, and video services on top of the Samsung hardware. “This gives us the opportunity to rethink not just the desktop but the whole desktop experience,” as well as the huddle room, via a Fuze-Samsung tablet combo, Hanson said. While this Fuze UC partnership isn’t exclusive, it is the first of its kind for Samsung, said Couteau, noting that the two companies will work together on technical and go-to-market strategies. While visiting the Metaswitch Networks booth, I caught up with Chris Carabello, senior director of product marketing, for a demo of MaX UC, the in-network, mobile-native UC&C solution it introduced earlier this year. With MaX UC, which is built on the company’s MaX collaboration platform, Metaswitch is taking a stab at fixing the problem long plaguing mobile UC -- that being, low user adoption. Because mobile UC apps typically don’t use a smartphone’s native dialer for calling, mobile workers have largely shunned them, finding the need to launch a separate program an unnecessary extra step, as Finneran has often discussed. Instead, they “go off the reservation,” often using their personal IDs to make business calls, Carabello said. Not only does this mean they’re not in compliance with IT policy, but they’re wasting the company’s UC investment. Because the MaX platform sits within the operator network, MaX UC can take advantage of the iOS or Android phone’s native dialer, treating that as the primary user interface for collaboration, including video meetings, messaging, CRM integration, and, of course, voice calling (with carrier-grade quality of service). In addition, the solution taps into the network’s intelligence, learning from calling patterns and automatically switching between business and personal IDs in BYOD and corporate-owned use cases, Carabello said. Should a user click on a video meeting invite in email, for example, MaX UC would identify the user with business credentials rather than personal ones. MaX UC is meant as an offering for mobile operators looking to deliver UC and collaboration to their business customers -- an opportunity Carabello said he feels is theirs for the taking given the mobile-first push among enterprises. That said, he had been conducting plenty of demos on the Expo floor for enterprise attendees scoping out mobility options, he added. While many office employees have already shunned their desk phones for making calls at work, the experience between the two device types is dissimilar. Enhanced Dialer for One Talk, however, will give users access to the same features they have on their desk phones. These functions, which include multiline calling, executive-assistant line sharing, call transfer, and call hold, are built into the One Talk-enabled Galaxy display dialer, Verizon said. When they’d like to work from a larger screen than provided by the Galaxy phones, One Talk users will be able to hook up to external displays via the DeX technology mentioned above.